I forgot the peanuts! I hate it when I make a recipe, photograph the whole thing, eat it, and then realize I completely forgot one of the ingredients. Ha! #braindead Anyway, when you’re looking at the photos of this Nam Sod, just imagine little pieces of nice crunchy peanuts on top, mmm-kay? Cool. So what is Nam Sod? 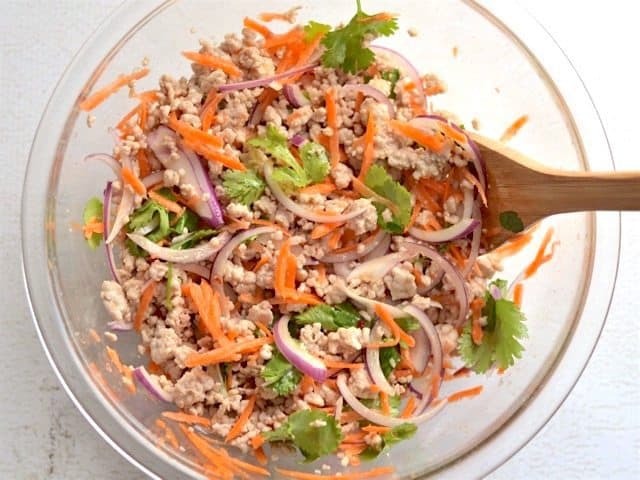 It’s a pork salad seasoned with a flavorful dressing made with lime, ginger, chili, and fish sauce. This stuff is super tasty, is nice and light, but completely filling at the same time. 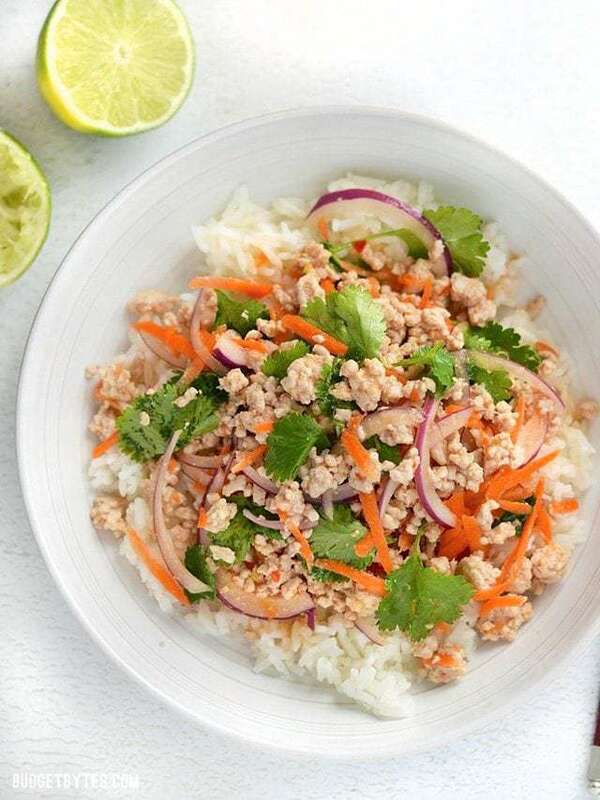 I served mine over rice just to bulk it out a bit, but it’s often served over greens, like shredded cabbage, or as a filling for lettuce wraps. I bet it would be pretty good over thin rice noodles, too! Nam Sod is traditionally pretty spicy, but my stomach has been a bit sensitive lately, so my version is a little softer. I left out thinly sliced fresh chilis and opted to use a chili garlic sauce instead. I also went a bit lighter on the fish sauce because, while I do appreciate the potent elixir and the savory base it brings to dishes, I don’t like heavy doses of the stuff. Feel free to adjust the fish sauce, chili, and ginger in the dressing to fit your taste buds. AND, if you have fresh mint growing, add a few sprigs of that as well! 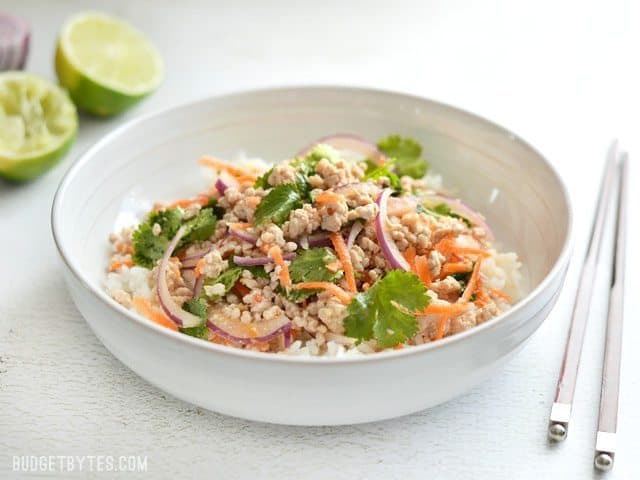 Nam Sod is a vibrant and freshly flavored pork (or turkey) salad drenched with a lime, ginger, and chili dressing. Light, filling, and flavorful. Make the dressing first to allow the flavors time to blend. 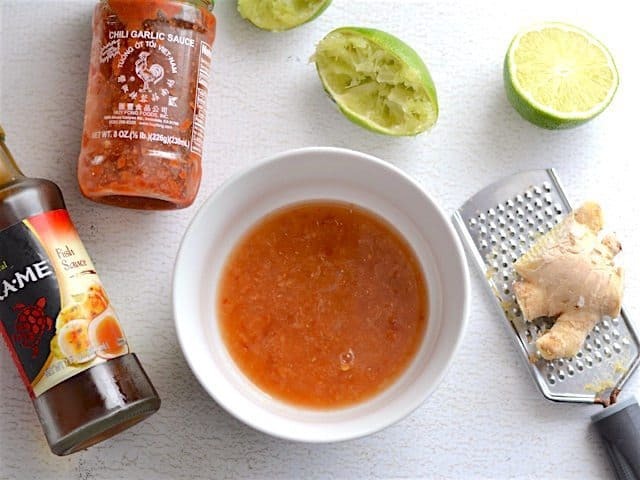 In a small bowl combine the fresh lime juice, fish sauce, fresh grated ginger, and chili garlic sauce. Stir to combine, taste, and adjust the fish sauce, chili garlic sauce, or ginger to your liking. The dressing should be very potent. Add the ground pork to a large non-stick skillet along with 1/2 Tbsp canola oil and one minced clove of garlic. Cook the pork over medium heat, breaking it up into small pieces as it cooks, until it is cooked through (about five minutes). Drain off any excess fat and allow the pork to cool a few minutes, or until it is no longer hot. While the pork is cooking, peel and shred the carrot using a large holed cheese grater or mandolin. Slice the red onion into very thin strips. Pull the cilantro leaves from the stems. 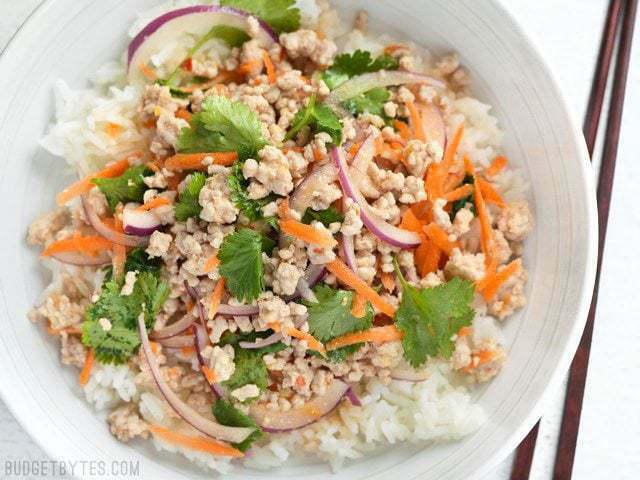 Transfer the cooled pork to a bowl, add the prepared dressing, and stir to combine. 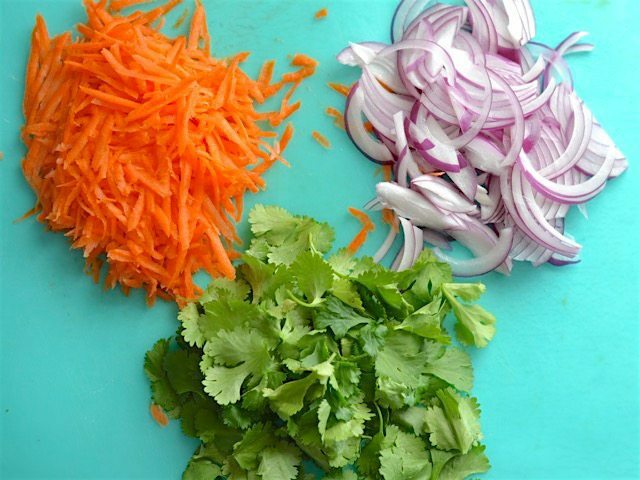 Add the shredded carrot, sliced red onion, cilantro, and peanuts. Stir to combine again. Serve the salad over a bed of cooked rice, shredded greens, or fill large lettuce leaves with the mixture for lettuce wraps. Start with the dressing so the flavors have a bit of time to blend. Combine 1/4 cup fresh lime juice, (about 2 limes), 1 Tbsp fish sauce, 1.5 Tbsp grated fresh ginger, and 1/2 Tbsp chili garlic sauce. 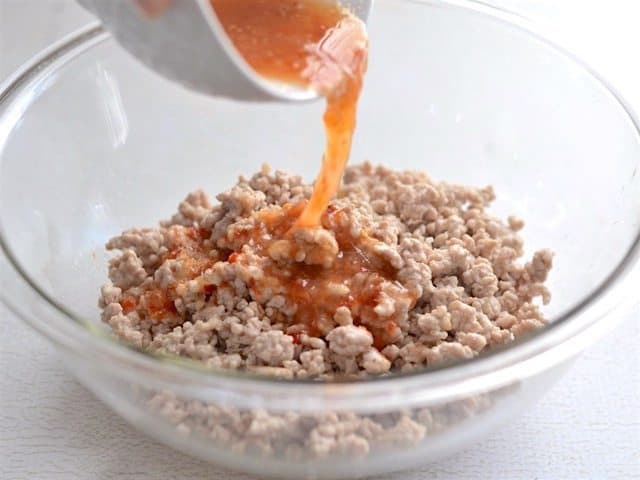 If you don’t have chili garlic sauce (or sambal oelek), you can add a minced clove of garlic and some red pepper flakes. Fish sauce is a main flavor here, so it can not be substituted. 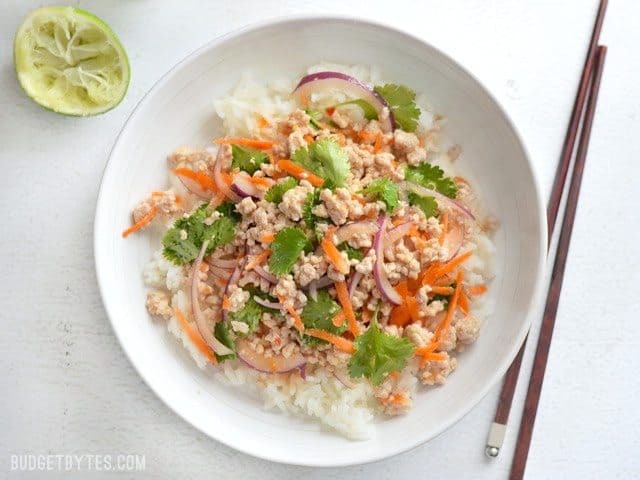 You should be able to find fish sauce in the ethnic food aisle of most major grocery stores, at some health food stores, or at ethnic markets. Next, cook 1 lb. 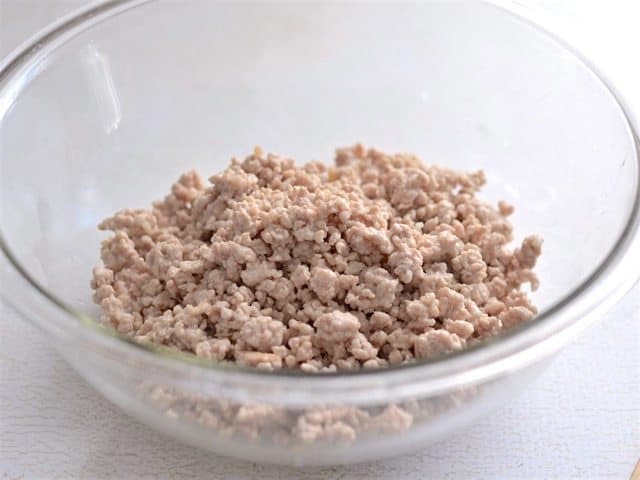 of ground pork (or turkey) with 1/2 Tbsp canola oil and one clove of minced garlic. Sauté the ground pork in a large non-stick skillet until it’s cooked through (about five minutes). Avoid over cooking the pork as you want to make sure it stays moist and tender for the salad. Drain off any excess fat and allow it to cool slightly. Once mostly cooled, transfer to a large bowl and pour the dressing over top. Stir to combine. While the pork is cooking/cooling, peel and shred one carrot. You can use a large holed cheese grater for this, a spiralizer, or mandolin. Thinly slice 1/2 of a small red onion, and pull the leaves from about 1/4 bunch of cilantro. 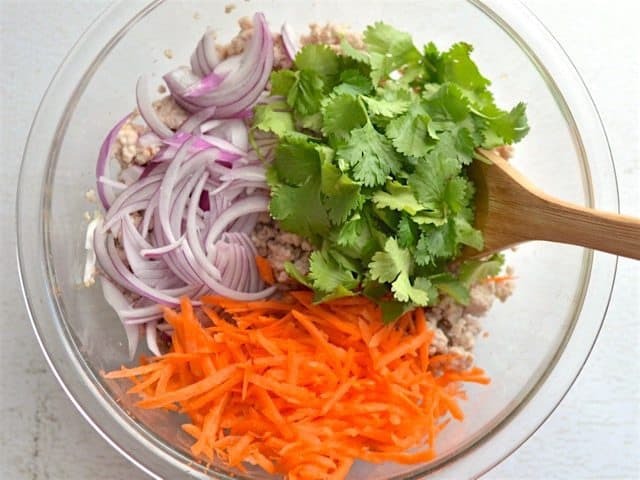 Add the carrot, onion, cilantro, and 1/2 cup unsalted PEANUTS (sorry, I forgot the peanuts in the photos) to the seasoned meat. Stir the salad to combine. And that’s it! (adjustments can be made to the dressing even at this point if it’s not where you like it). 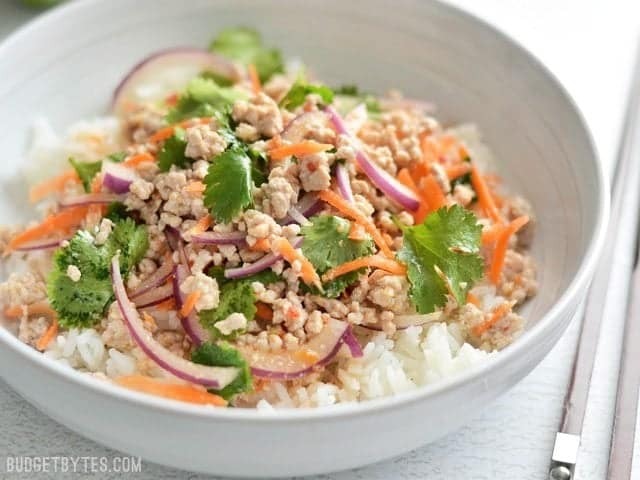 I served my Nam Sod over a bed of rice because I wanted to really bulk it up, but a lot of people eat it over greens or inside lettuce wraps. I made sure to get a little bit of the dressing from the bottom of the bowl to drizzle over the rice. MMMmmmm. I made this for a Christmas party last year and served it as lettuce wraps. I made half with pork and half with tofu. I won the prize for best dish and people are begging me to make it again this year! Loved this recipe. Wouldn’t change a thing. So simple yet so tasty (even better the next day). Vietnamese cuisine is one of my faves. Cant wait to try this. How would this pack for lunch the next day?? Would you serve it hot over hot rice or room temp over hot rice? Thanks!! Another great recipe! I’ve made this twice using ground turkey because ground pork isn’t always available at my supermarket. To take the “bite” out of the red onions, I soak them in ice water with some lime juice for an hour or so. Really mellows the flavor if you’re not so into raw onions. Great tip about the onions!